Is that a statement, or a question? Does that always come with a long pause, waiting for an answer? I told her how I fell in love with her in the first place just minutes before her plane took off. I just blurted. Those words came out of my heart, while I knew that her boyfriend was waiting for her. I gave her no pause, no time to express her shock, no chance to say anything. I didn’t want an answer because I knew from the beginning that she wouldn’t be mine. You can’t impose love. It arises unwittingly. You can’t withhold love. It will blight eventually. It was an “I love you” without question mark. …but we ate turkey anyway! 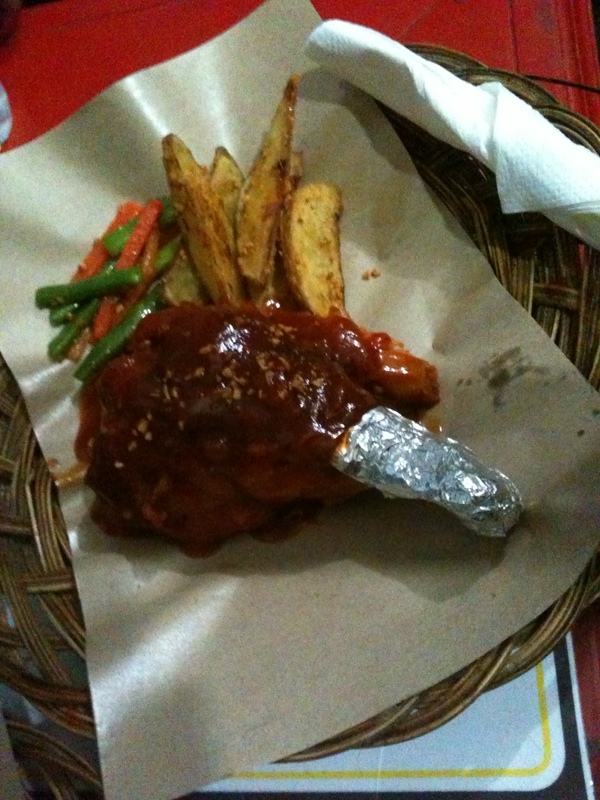 It started when my friends and I running out ideas for a place to eat in Bandung. Out of the blue, one of us mentioned “turkey!” and there we went. 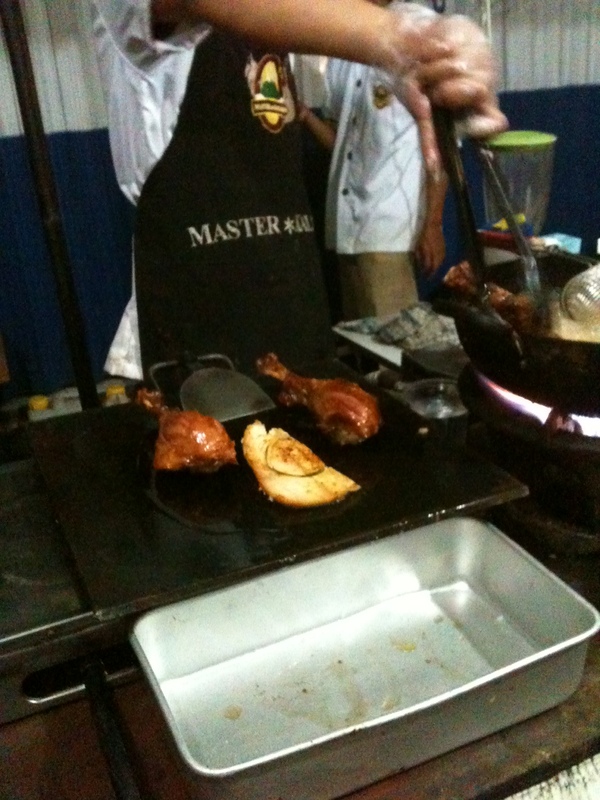 Turkey isn’t a normal dinner for Indonesian. I never eat that before. All I know about turkey is western people eat that kind of bird on thanksgiving. 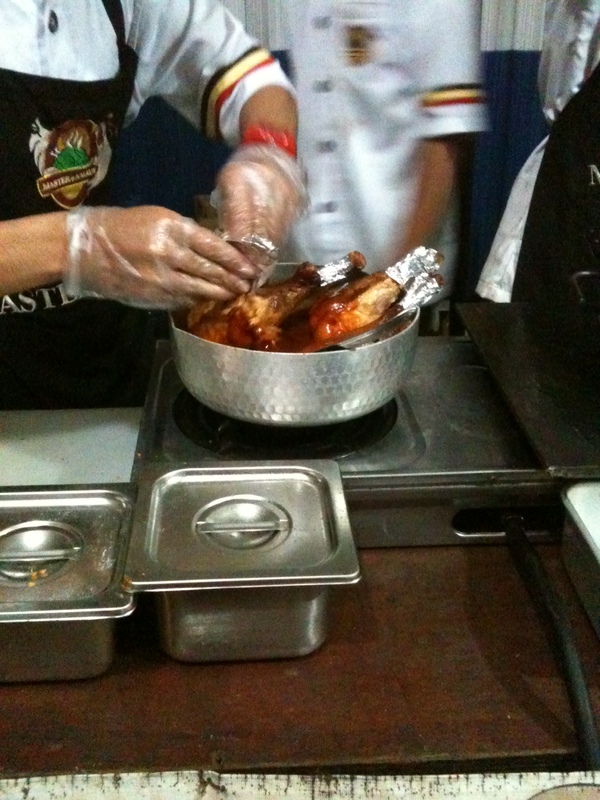 There are a place to eat turkey (or “kalkun” in Bahasa) in Bandung. 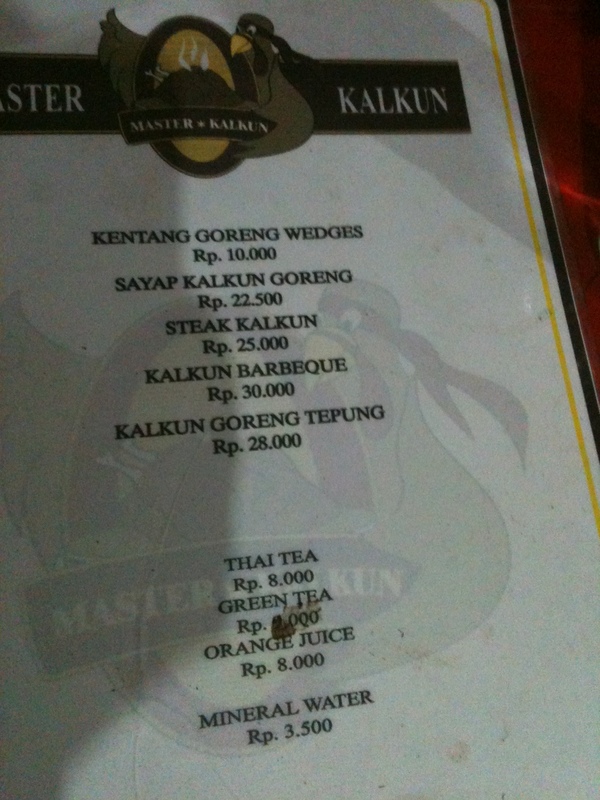 It is called Master Kalkun at Jl. Cihampelas no 78. We were looking for a restaurant and it turned out to be a “warung tenda.” They open at 6 p.m and here is the menu. I recommend you to order Kalkun Barberque. 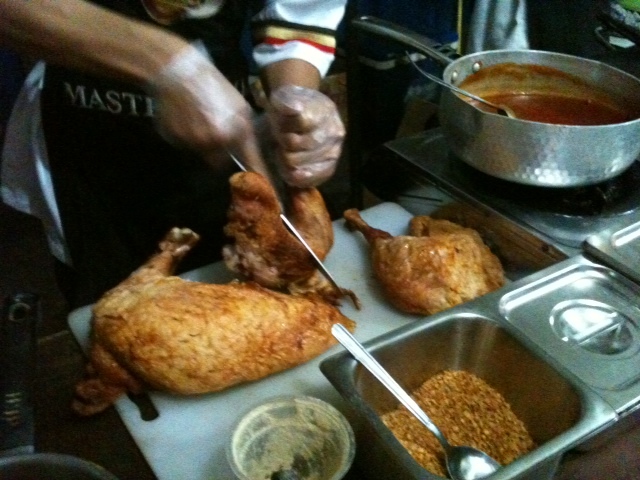 It’s turkey’s drumstick marinated in BBQ sauce. It’s worth the price. The “Kalkun Goreng Tepung” was disappointing because the portion’s too small. 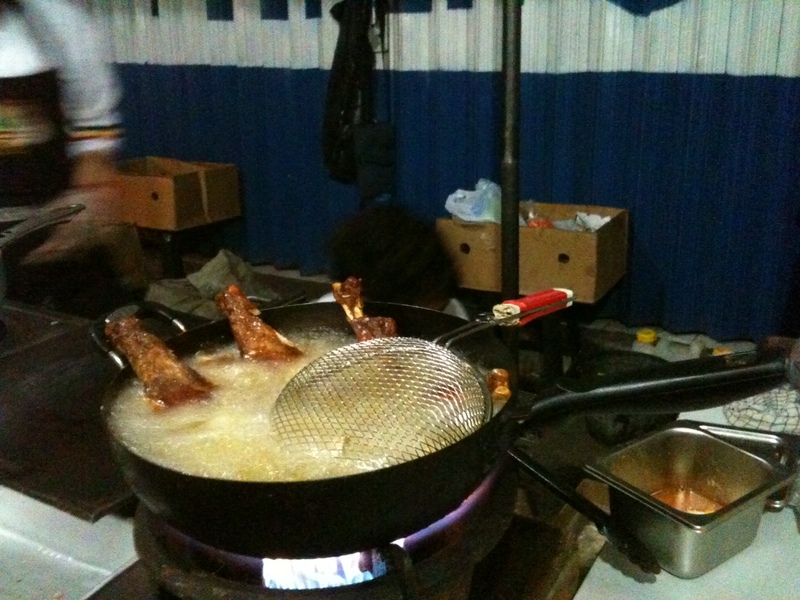 I ate there with three guys hahaha. When I was a little, my dream was to work in Kuningan or other business district in Jakarta. Standing between those tall buildings and watching lights from those offices were my aims. Again, I was a child. I didn’t know about the traffic, the workload, or the people. Ten years later, here I am; living my childhood simple dream. It isn’t precisely the manifestation of my dream but there’s still many things to be grateful for. It is only a internship, yet it still gives me income. It is also a gateway for me if I want to get serious in this business. They give me a big learning opportunity and it will be ungrateful if I waste it. Have a chance to meet great people from various background is what I’m grateful for too. On my first week, my supervisor told me that I was too quite. Truth is: I’m feeling inferior among those people. But then, I will be one of them in a short time. My extreme background difference won’t be an obstacle, it will be a challenge. Jakarta has know for its cruel traffic jam. I work in the central of the city and I live in in the side of city. Kostan will cost me more so I choose to face the traffic everyday. Using transjakarta, I try to believe that public transport is the best option. Radio & earphone are my best friends during my trip everyday. Matter of fact, I can spend these 2 months to sit idle, enjoy my life and go to somewhere far. But again, this kind of opportunity is rare. Yes, it’s tiring. But, great things won’t come easy. I’m young and I have to had my own struggle, my own mistakes, and my own experience. Enjoy the moment and don’t forget to be grateful everyday.